I can’t say this enough: visual schedules have saved my sanity at home with my little guy. I knew and used visual schedules when I taught pre-k. I had a pretty fancy one, and I had the students move a paper clip as we progressed though our day. It really helped! After the first few weeks, most kids didn’t NEED it, but a few did. Turns out my kid is that kid. The one that needs the schedule up… all… year… long. I don’t know why I didn’t create a visual schedule for our home life sooner. It started with potty training. Autism Speaks has some great resources, including a potty training packet with a visual schedule. However, the designer in me thinks most visual schedules are cartoonish, chunky, and not very pretty. 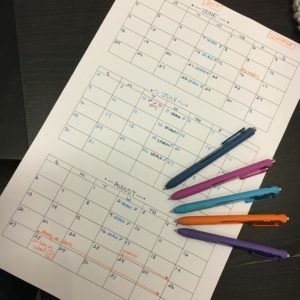 I created my first schedule when my son started Pre-K. The transition was terrifying. Mostly for me! The schedule helped both of us feel prepared. 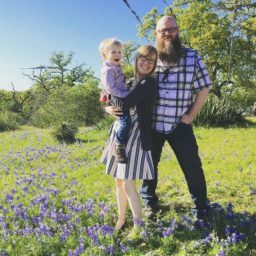 After my daughter was born six weeks early, our life kinda went completely off a schedule. As long as my son had a schedule at school, I was able to keep a sorta routine in the evenings. But then Thanksgiving break came along a mere 2 weeks after our week in the hospital. Insanity. My husband worked a few days of the break and I had a 3 week old preemie and a Autistic 4 year old all to myself. And I was running on 45minutes of sleep every 3-4 hours. I couldn’t deal, negotiate, or plan. We watched movies, we snacked all day, and I didn’t put up much of a fight to my 4 year old dictator. Even with my husband home, my son’s schedule was so off, plus the new baby. It was basically torture. Christmas break came around, and I was dreading two weeks with both kids. While I couldn’t fix the sleep depravation, I could provide the needed structure for my son so he didn’t go bat crazy. Thus, the visual schedule. I created one that would fit our family needs. And I did it in about 20 minutes while the baby was sleeping. And I recorded it as a tutorial. Yes, there were dishes in the sink, but I felt like a super hero! The best part was, it worked! More structure, and less screaming. Sanity saved!!!! I want you to enjoy some sanity this summer, give your kiddo some structure and generally just feel like a hero. 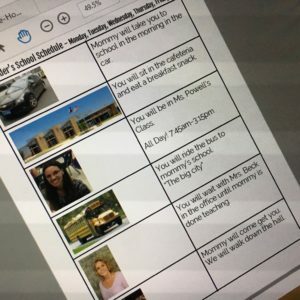 Try creating your own visual schedule with Google Docs. Enjoy my tutorial video, examples, and feel free to use my template. Looks very useful and exciting and I looooove lists! Plus, these templates are fab. Great job! I remember creating a schedule with times when Marshall was 5. It was a large poster that I hung on the wall. If I was just a minute off, he would correct me. It lasted maybe a week before “crazy mommy” went and ripped it off the wall.